Since I posted a video of the group, "Sweet Honey in the Rock" singing the song, "Ella's Song," which was named after Ella Baker, I'm doing Ella Baker as Hope is Real's first "Womyn of the Week." (And yes, this post is repeat of a post from Femi-Nation...) The main words in the song are, "We who believe in freedom cannot rest until it comes" - one of her famous sayings. 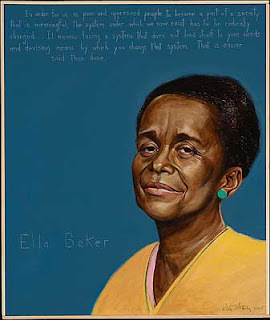 Ella Baker was born in 1903 and was a major civil rights activist. She believed it is better to work behind the scenes than to have centralized figures of authority. She is famous for saying, "Strong people don't need strong leaders." In 1927, Baker graduated from Shaw University in Raleigh, North Carolina. She then moved to Harlem and started organizing consumer cooperatives during the Great Depression. In 1938, she became part of the NAACP's staff. She traveled South to build up local branches, which became the start of the Civil Rights Movement. But by 1946, her duties for the NAACP were more focused on integrating New York City public schools. In 1957, Ella Baker helped create the Southern Christian Leadership Conference, which helped establish Dr. Martin Luther King Jr. as a major Civil Rights figure. Baker and King clashed, for Baker thought that King was too controlling and did not put enough energy into empowering others. Baker founded the Student Nonviolent Coordinating Committee in 1960, when four students were denied service at a university cafeteria. This committee led sit-ins in cafeterias across the country and opened the doors of activism to people who had previously been overlooked, like young people and women. In 1964, Ella Baker moved back to New York and worked tirelessly for human rights until her death in 1983. Ella Baker was right-"We who believe in freedom cannot rest." She is also right in that human rights leaders should always be more concerned for the people, and especially the most marginalized people, of whatever group they represent than their own ego. I think of how Pat Robertson, who is so obviously misguided and is nothing like Martin Luther King Jr., recently said that the Haitians are better off now than they were, because now they have a chance to repent. He has said similar things about every kind of natural disaster that has occurred since he has been in a public position. What a fool! I wish that people did not listen to him. I wish that his idiotic sayings were ignored by the media and that the Ella Bakers of this world were the ones uplifted, but that is not how this world works-those who do the truly great works in this world are never verbally given the credit they deserve, for they are the ones who know that receiving credit is not what is truly important.